For many of us, our day's activities can't begin until we have had our first cup of joe, so, getting the right coffee maker is important. Braun coffee maker owners hold their appliances in high regard when it comes to whipping up excellent drip coffee, but do they live up to the hype? According to the manufacturer, the Braun coffee maker is more than a simple on/off switch. Features like programmability, thermal carafe, settings that lets you adjust your coffee brew strength and more bring customers back for more. It’s no secret that if you try to find a coffee maker online right now, you are going to feel overwhelmed. There are thousands of different brands and models. It can be hard to know which one to purchase and which one to stay clear. It will also be complicated if it is your first time buying a coffee maker or replacing the one you bought a while ago. We understand your frustrations, and hopefully, this review will help you purchase the right coffee maker for your needs. One of the simplest ways most consumers narrow down which coffee maker to buy is by looking at the brand. Braun is a well-known coffee maker. They have become popular over the years due to their dedication to quality products that work well for a very long time. Here are a few favorite Braun coffee maker models. SATISFACTION IN EVERY CUP With Braun's innovative PureFlavor system, your coffee is made at the right temperature and the right brewing time to extract the best coffee flavor and aroma. KEEP THE FLAVOR INSIDE The unique carafe lid seals in the fresh flavor by minimizing air exposure and the anti-drip system lets you pour with precision - any time during the brewing cycle. EASY OPERATION The digital control panel buttons are displayed in the same way you read - from left to right. If it is your first time using a Braun coffee maker, this model is going to surprise you. Its modest appearance and low price might get you thinking it lacks the chops to whip excellent drip coffee. The Braun BrewSense KF7170S is a rectangular block with round edges, 14 by 8-inches wide. This coffee maker is light and made from mostly black plastic. It has a thin skin of stainless steel that covers three-quarters of its chassis adding a touch of class. The Braun BrewSense KF7170S can brew up to 12 cups of coffee (five ounces each). Its basket accepts either gold tone permanent filter or #4 paper coffee filters. It has a control panel with a tiny LCD screen on its front face. Nine buttons are at the bottom edge of the panel, with a circular key under that. You can use these buttons to perform various functions such as brewing immediately or scheduling one in advance, setting the clocks time or engaging the Braun coffee maker cleaning cycle. It has a 4.6 out of 5 stars rating based on Amazon consumer reviews. Has a Flavor carafe with a special lid that seals in the coffee aroma and keeps your coffee hot for longer. The Braun BrewSense KF7000BK is a sleek and stylish black finish 12-cup drip coffee maker with a pure flavor brewing system. This compact Braun coffee maker has a 24-hour programmable timer and an anti-drip system that lets you pour yourself a cup mid-brew with no mess. Its pure flavor system brews your coffee at the exact right temperature and brewing time to extract the best aroma and flavor. This Braun coffee makers also has an advanced strength selector that allows users to enjoy coffee both regular and bold. Its quarter selecting function is also beneficial for the perfect flavor when brewing with a smaller pot of coffee. The Braun BrewSense KF7000BK measures 7.9-inches (length) by 7.8-inches (width) by 14.2-inches (height). Its dishwasher safe carafe and UL listed. You will get a 2-year manufacturer’s warranty when you purchase this coffee maker. The Braun BrewSense KF7000BK scores a cool 3.8 out of 5 stars rating on Amazon. The BrewSense KF7150BK is yet another drip coffee maker. It scores a cool 3.8 out of 5 stars rating when it comes to consumer reviews. It is perhaps one of the most celebrated Braun coffee makers for its compact design. One of the outstanding features about the BrewSense KF7150BK coffeemaker is it enables you to get excellent coffee making components in a very tiny, small unit. Thanks to Braun’s focus on electric coffee brewing, coffee lovers get to enjoy quality coffee without using up all their counter space. This model also provides features that are super easy to understand, and it seems to be an all-around winner with its average brew time. Coffee quality is guaranteed thanks to its PureFlavor technology. According to Braun, this feature extracts all the flavor from the grounds while ensuring the brew taste the same. Meaning there isn’t a significant difference whether you drink the first cup that drips or wait until the carafe is full. It scores an impressive 3.8 out of 5 stars rating on Amazon based on client reviews. Finding the best coffee makers is a hectic process, mostly because the best coffee maker is different depending on what you need. Here are few coffee makers that are turning heads in the coffee industry and closely rival the Braun, coffee maker. This coffee maker is designed to bring both the lovers of tea and coffee together. This is one feature that makes the Cuisinart CHW so popular. It has a separate hot water dispenser that is perfect with lovers of tea, hot chocolate as well as coffee fiends. It’s designed with an adjustable carafe temperature, looks stylish and dispenses directly into your cup. Just like the Braun coffee maker, it has a brew pause feature which lets you sneak a cup. A bonus advantage apart from brewing both tea and coffee is its safety lock feature on the bottom. Some of the drawbacks to this excellent coffee maker is it's loud. You will wake up a few light sleepers in your family if you have to sneak an early morning cup of coffee. It’s also a bit difficult to fill the reservoir, and you need to watch out for the limited guarantee, you pay to send back. The Cuisinart CHW from Cuisinart scores 3.8 out of 5 stars based on Amazon customer reviews. Just as the name suggests, the CucinaPro Double Coffee Brewer can simultaneously brew up to two pots of coffee at the same time. This unique feature makes it stand out from its competition. The CucinaPro Double Coffee Brewer is ideal for offices and large families that require large batches of coffee at a time. This coffee maker comes with two inbuilt permanent filters and coffee scoops. These filters are designed to allow fluid flow of water through the ground coffee. This makes surprisingly rich aromatic coffee. The CucinaPro also offers the option to control the heating elements individually. This is important since it allows the user to brew two pots of coffee simultaneously without being dependent on each other. Some of the few drawbacks are that the CucinaPro Double Coffee Brewer takes up a lot of counter space and it doesn’t turn off automatically. 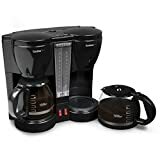 This double coffee maker has a rating of 2.8 out of 5 stars on Amazon. 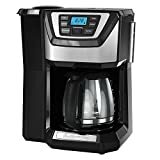 If you are looking for an affordable grind and brew coffee maker in the market that is under $100, then the Black and Decker CM5000B is worth considering. This coffee maker uses an all in one grinder and filtration design. This makes the cleaning process a lot easier. The Black and Decker CM5000B is a 12-cup coffee maker with a built-in grinder and users can choose to use ground or whole bean. Its Quicktouch panel allows users to program the coffee maker easily and quickly. Just like the Braun coffee maker, it has a 24-hour brew option. You can also temporarily pause the brewing process to pour a cup before it ends. Some of the drawbacks of the Black and Decker CM5000B are it's quite large, and takes up a lot of counter space. It also has an integral grind, meaning it cannot be separated to set up individually. Users could easily get confused about the functions of its many buttons. The Black and Decker CM5000B has a 3.7 out of 5 stars rating based on consumer reviews on Amazon. Braun has a full line of coffee makers that offer both style and size for every kitchen. Operating this coffee maker correctly is key to a perfect morning cup of joe. The Braun coffee maker is no doubt easy to handle when clean. It is also available in eight to 12-cup models, all operating in the same manner. 1 Fill the coffee maker carafe with water to the desired amount. Pour water into the water reservoir on the coffee maker. 2 Place your paper filter into the coffee maker’s filter basket. Pour ground coffee into the filler basket and place the basket into the water reservoir in the filler holder. It will take about three-fourths of a tablespoon of coffee grounds per cup to get medium strength coffee. 3 Place the carafe on the coffeemaker warming plate. Turn the switch on and allow the coffee to brew. Remove and pour once the carafe is full, and brewing has stopped. Now, empty the filler basket and rinse any coffee grounds from the basket. Replace it, in the basket holder. Enjoy your fantastic cup of coffee. There is no doubt that the Braun coffee maker packs a lot of convenient features into its compact size. Most of the reviewers said they liked its strength, aroma, and taste. This coffee maker is known to get your coffee to a temperature that is nicely hot to consume. Sitting on its warming plate, it loses only 3 degrees of heat, that doesn’t adversely affect its strength or quality. The Braun coffee maker is quick to brew a full pot compared to its close competitors. If you need a quick cup to get you up in the morning, there is a brew-pause feature that gets a quick cup while it is still making coffee. This coffee maker has a less likelihood of spilling due to design; you will not end up with a drippy mess. The Braun coffee maker can also be automatically programmed within a 24-hour period to brew a pot when you need one. The buttons on the machine help dictate how strong you want your coffee. You could also do that by adjusting the amount of coffee or water, but it’s nicer to have the options on the controls. However, after a little trial and error, you will soon become familiar with which settings create the best coffee for you. One of the drawbacks of Braun coffee makers is that not all the models come with an alarm that notifies you when the coffee is ready. Meaning you could lose out on getting the freshest cup of coffee. Another drawback of the Braun coffee maker is that you cannot substitute the thermal carafe, you need to use the included glass carafe. You have the option of brewing coffee using paper filters or the already provided gold tone permanent filter. However, there will be slightly more sediment in the coffee from the permanent filter. The Braun coffee maker also comes with a cone-shaped brew basket, that compresses the coffee grounds and water in a fashion that experts say brings out the most considerable amount of flavor. Also included is a charcoal water filter that can improve the taste by absorbing unpleasant odors and flavors from tap water. Braun products are a real set-it-and-forget-it appliance. You will get an LED light that will alert you when your coffee maker needs descaling, and its programmed cleaning cycle takes care of that for you. Also, the two-year warranty that you get after purchasing a Braun coffee maker is double the industry average. Braun’s well-designed coffee makers have come close to gold standard for delivering a rich, standard hot cup of coffee. Fitted with nice extras and handsome stainless steel, the Braun coffee maker has won the hearts of its buyers over and over again. So, does the Braun coffee maker have any drawbacks? Here are a few pros and cons that stood out. If there is one thing that stood out from most about the Braun coffee maker is, most of the consumers rated it for consistently delivering a rich and bold flavor depending on the beans used. Furthermore, depending on your preference, you can adjust the taste settings for a stronger or lighter brew. Unlike some co​​ffee makers, a Braun coffee maker has a low operating noise. You could easily brew a cup of coffee without waking up your entire household. What’s best, if you have your coffee maker in a room near you, and it’s on a programmable timer, you don’t need to worry about the disruption caused by the boiling noise. The Braun coffee maker combines the features of a modern coffee maker and a traditional percolator, evident with its digital display. Users can adjust the settings of the coffee maker depending on their preference. For instance, you can regulate the temperature of the heating plate through the digital menu. Most coffeemaker owners experience the inability to evenly disperse hot water to use all coffee beans in the pot. Braun coffee maker luckily offers perfect water distribution. This will not only reduce splash back but will also ensure that every grounded seed is submerged correctly. It’s imperative that you wash the carafe before first use. You will also need to put the system through a self-clean process before brewing your first pot of coffee. Otherwise, you will experience a pot that has a plastic taste for your first couple of uses. It’s advisable that you do not use the warming plate regularly. Just like any other coffee maker, if you allow prior brewed coffee to stay too long on the warming plate, it will acquire a stagnant taste that will spoil the entire pot. To bring you the most up to date and accurate review of Braun coffee makers, we did some in-depth, independent research. We looked through Braun coffee maker reviews, coffee maker forums, retailer and manufacture product descriptions, complaints, customer reviews and more. After researching and comparing notes from the information we collected on Braun coffee makers, we firmly believe that it is the best coffee maker of its tier in the market. It’s compact, simple to use and makes a fantastic cup of coffee. If it is your first time buying a coffee maker, you will want to go with a Braun coffee maker, it's intuitive, with large buttons and easy to read. We hope this review helps you make a well-informed purchase decision. Happy coffee brewing! Previous articleThe Breville Coffee Maker: Is It the Right Choice for Your Kitchen?